South Korea's Constitutional Court has upheld a decision by the country's National Assembly to impeach President Park Guen-hye in a unanimous decision with all eight judges on the court voting to remove Park from office. Park is the first South Korean President to be impeached. An election for her replacement must now be held within 60 days. The impeachment decision was announced by Justice Lee Jung-mi in a live, national broadcast. 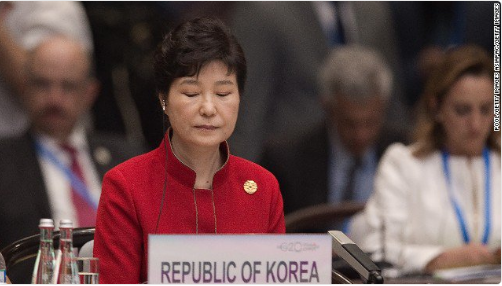 Park's problems began in October 2016, when revelations emerged about the influence her confidante and adviser Choi Soon-sil had over the Presidency.